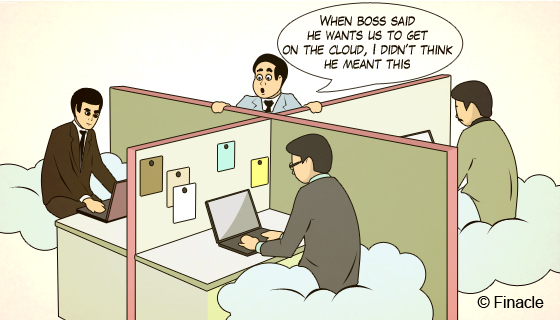 It's easy to get confused about the cloud. Just two days before Christmas, my cell phone met an early, tragic fate when it fell (was dropped…) into a tray of water. Five days later, when I purchased a new phone, I ecstatically found that all my contacts, messages, apps, and even my most recent pictures were still on my brand-new device, even though I had never seen this physical phone before – all thanks to the ever-elusive, ever-present technological data-beast: the cloud. 2015 was the year the cloud ingrained itself into just about every internet-based individual’s life – to an extent that the large majority may not even realize. The cloud is everywhere. Any web-based mail server – Yahoo!, Gmail, etc. – uses the cloud to store every email you have sent and received, such that you may access these emails from any device. Granted, if attempting to enter your account from a new device, you may come face-to-face with the somehow irritating “We do not recognize this device and must verify your identity with three more steps” message; however, save for these small annoyances, you can access your email at an alarmingly convenient number of different places – anywhere, essentially, with the exception of those non-Internet-connected areas. Any bank app that allows you to monitor your financial statements from your phone, to securely deposit a check with the quick capture of two photographs, to send or receive funds with the press of a button – these apps use the cloud to keep your information safe AND accessible. Perhaps it is the nature of growing up at the end of the 20th century/start of the 21st, but I can count on at least two hands the number of times I’ve needed to check my bank account on the spot to ensure that I had enough money for gas or dinner or what-have-you. Other, more financially secure individuals may not have experienced this, but perhaps you forget what account you have enough funds in – in which case, the ever-accessible cloud-based bank app hopefully comes in handy. Any online shopping database, particularly those with which you have an account, keep your personal and financial information stored securely, such that you can make a purchase on any computer or mobile phone or tablet, anywhere, by simply logging in. Any items you had in your cart, any items on your wish list – these will all still be present, no matter where you were (physically and technologically) when you last logged out. Any music service, such as Pandora or Spotify, utilizes the cloud, keeping track of your stations and your playlists as though you never logged out or changed devices. You can have the app of your preferred music provider on your phone, listening to it on the way to work. Then, when you get to work, you can log into the website or open up the app on your desktop, and continue listening more or less where you left off (with Pandora, it’s a bit different, but the general gist remains the same – complete, cloud-based convenience). The cloud makes life exponentially easier, both for the individual and, perhaps more relevantly, for the business. I say “more relevantly” because rarely does the individual have to think about using the cloud; we just do, in nearly anything we accomplish in our personal, mobile lives that relies on Internet connectivity. Businesses, however, must take a more conscious approach to virtualization. In my next two posts, I will explore in-depth a few of the key benefits of moving a business to the cloud. As we can see, it makes the people’s life faster, more streamlined, and constantly accessible. These advantages hold true for a business, as well, but there are a few nuances that individuals never have to consider. I will outline industry-specific examples of where the cloud can improve businesses considerably, and hopefully, by the end, you will have a better idea of how and when your business can make the switch. Share this story, chose your platform! Celebrating Earthnet's 1-Year Anniversary with Simple Energy! Congratulations New Venture Challenge 10 Champion and Finalists!! !